Muth Gnaar is a monastery in western Deshaan, just southeast of the town of Narsis. The local monks have been caring for those infected with the Llodos plague, using a relic of Saint Veloth to halt the progression of the disease. 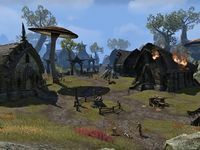 However, the monastery has recently been attacked by the Vereansu, a violent tribe of Ashlanders who burned much of it to the ground and stole the relic. This caused the infected to turn into the violent plague husks that are now roaming the center of the town, trapping many people in the ruined buildings. Muth Gnaar Objective: Help the Muth Gnaar monastery survivors. 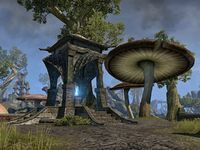 Muth Gnaar Hills Wayshrine is located north-northwest of the monastery, on the road from Narsis to Mournhold. 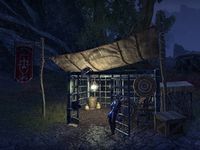 The Trade Pen guild kiosk can be found to the southwest of the Wayshrine. This page was last modified on 27 March 2019, at 23:29.